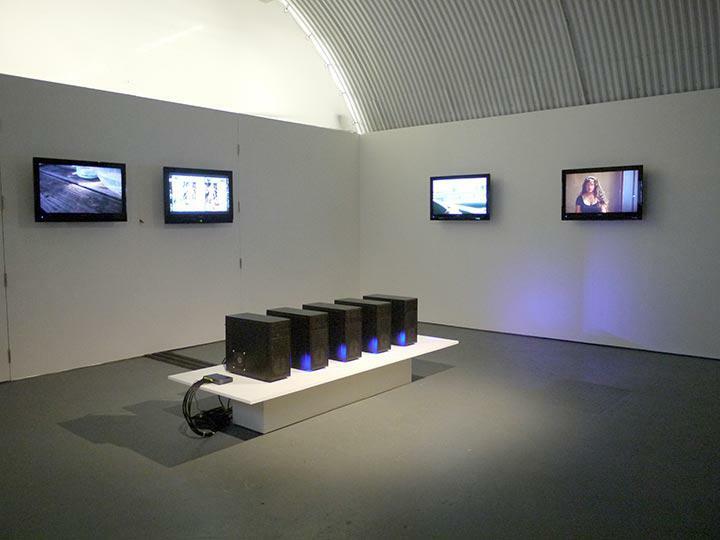 The exhibition comprises video works by six artists, which are exhibited to a soundtrack of Sanderson’s making. 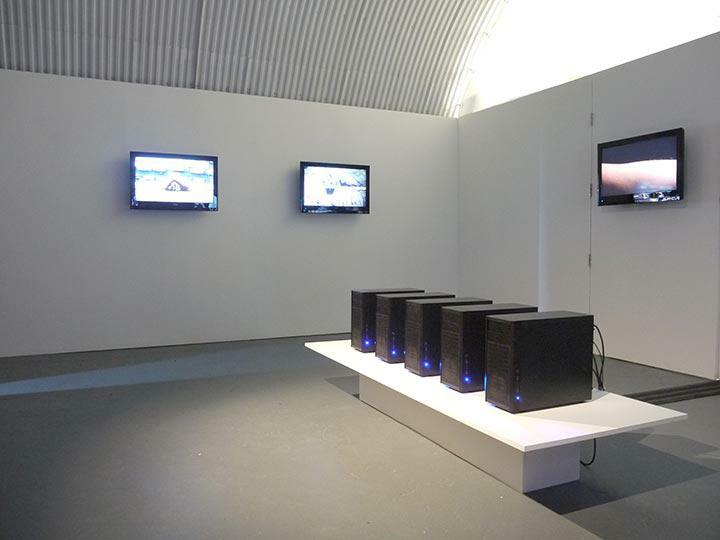 Sanderson also contributes a low bench supporting five computer terminals, seemingly to do with the playback of the works. The terminals are, in fact, a ‘render farm’ - a powerful multi-computer system used to perform processor-heavy tasks, such as rendering 3D graphics or housing the internet. The render farm is a part of Sanderson’s disarmingly developed wider thesis. 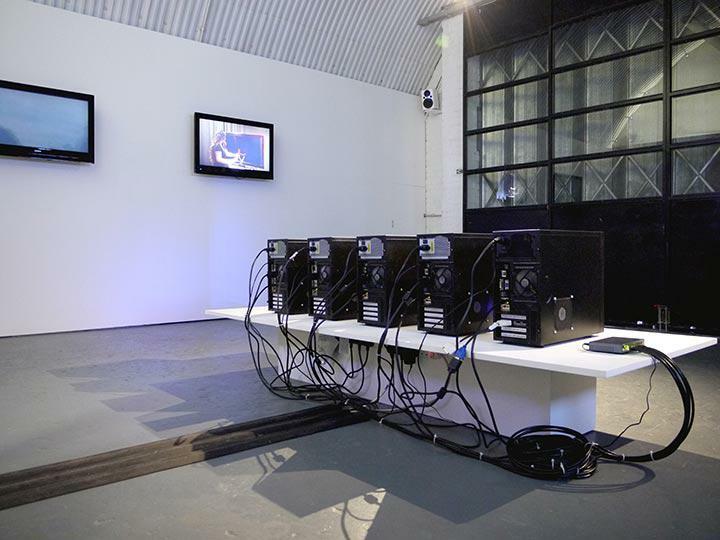 The physical presence of typically unseen technologies is an illustrative device employed by the artist, extending a body of research first exhibited in his text for Mute Magazine, ‘Human Resolution’ (2013). 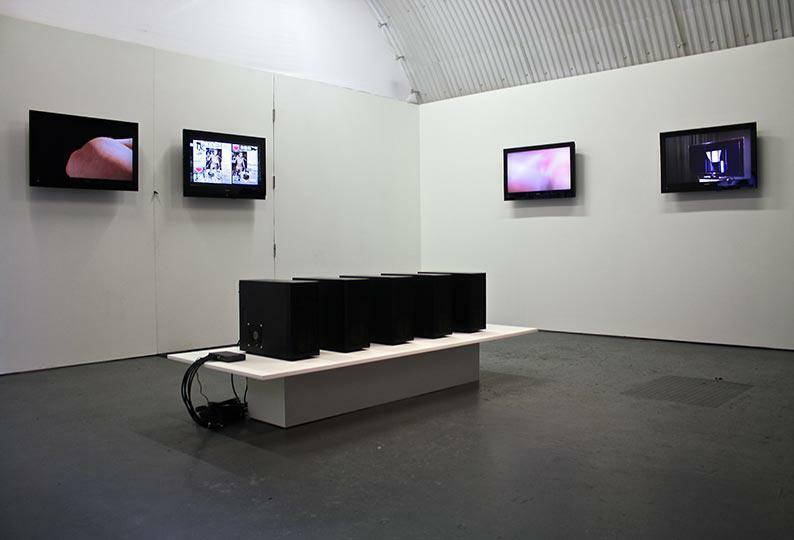 Sanderson’s text discusses at length the production, distribution and consumption of imagery online. Sure, it’s well-covered ground, but what’s interesting about Sanderson’s proposal is his aim to dispel the myth that images are immaterial, ethereal, virtual. Instead, Sanderson posits, images have direct and tangible links to the physical, and our inclination to believe otherwise is not mere philosophical misconception, but the ramification of a system that actively encourages opacity with regards to the technologies we use and, ultimately, the images we consume. Technologies that we are complicit with - that play vital functions in our everyday lives, personally and professionally - have their provenance in the military, surveillance, governmental bodies, etc. It is our carefully executed ignorance of this that Sanderson likens to global ignorance of the geopolitical conditions that produce things that we consume, image or otherwise: ‘fossil fuels’ rural migrant workers in Shenzan’ topsoil loss in Inner Mongolia’. 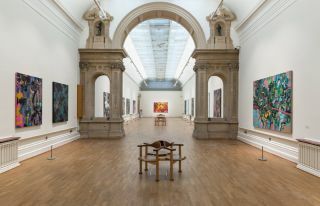 Some of the works presented alongside Sanderson’s demonstrate a direct and transparent conceptual crossover with these ideas. Hito Steyerl’s ‘Strike’ (2012) depicts the artist approaching an LCD screen and making a calculated blow with a hammer and chisel, breaking the screen and causing a fragmented, abstracted image to appear amongst the liquid crystals. Steyerl’s allusions to the culture of material labour (in both her choice of tools and the work’s title) are relevant points in the commentary on the virtual/real divide, or lack thereof, and the notion of online imagery as a commodity or resource, subject to material conditions. 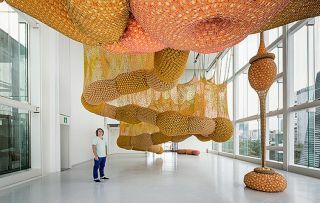 Other works are more loosely relevant to the installation, but meaningful links can be mined from texts surrounding this heavily theoretical show. 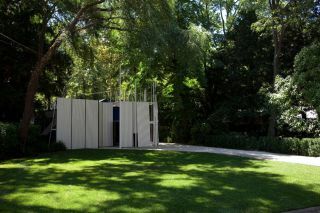 Two essays produced to accompany the exhibition, by Eleanor Weber and Michael Runyn, explain the web of references supplementary to the core works. Two further key texts to which these exhibition texts point are Sanderson’s aforementioned ‘Human Resolution’ and Steyerl’s ‘In Defense of the Poor Image’, first published in E-flux Journal in 2009. Sanderson’s speculation on the Cartesian dualism created by the separation of images from their material genesis in public perception is one of not few hypotheses hidden behind ‘Unified Fabric’s six screens. The impenetrability of this, at first seemingly simplistic, installation appears to be such a curatorially tight analogy that it again seems pertinent to question Sanderson’s role here. While ‘old-school’ curators get flustered at the thought of being too heavily illustrative with works of art or even, heaven forbid, executing something of a pseudo-artistic gesture, Sanderson and the curatorial team at Arcadia_Missa plough on to produce a tightly curated show which is simultaneously a bewildering and intriguing artist’s installation.